Phew! I don't know if it is this way for anyone else, but I feel like November kinda came in like a wrecking ball. My mother-in-law is having a difficult time adjusting to the change and the weather getting cooler, not to mention my husband had surgery as well. It's been a busy, busy time and if you feel like I've been neglecting the blog, I'm sorry. However, I'm back and since life has been so crazy I'm going to be bringing you loads of easy and inexpensive dinners that you and everyone in your home are sure to love. First off, my Chicken Cordon Bleu Bake Recipe. After that you will need to combine the cream cheese and 1 cup of the shredded cheese into a microwave safe bowl. Place the bowl into the microwave for 1 minute, stirring halfway through. After a minute remove from the microwave and stir together. To a greased 13x9 baking dish add the chicken and ham. Let's take a second and talk about the chicken and ham. I am using leftover chicken in this dish. I knew I was going to be making this, so I made some extra chicken the other night, but you can use boiled, rotisserie, roasted, deli, canned WHATEVER kind you want. The same goes for the ham. I used a diced ham steak, but you can use leftover ham, deli ham, any kind you like! Now add the frozen green beans. 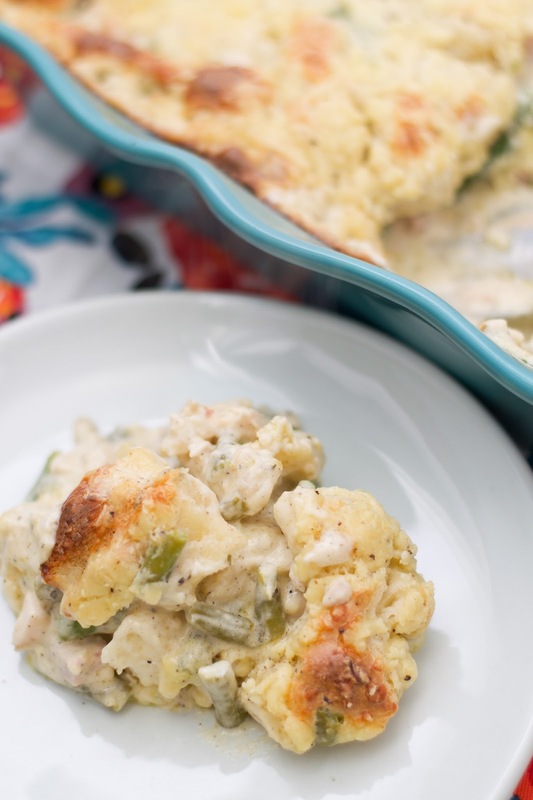 For the bread portion of this casserole I like to use canned biscuits. You will need to cut each biscuit into 8 pieces, yes EIGHT pieces. These will grow and expand in the dish, so you will want them to be small. Add the pieces of biscuits to the casserole dish. Now pour the sauce over everything. Take a spoon and mix everything together. You want to be sure that everything is COVERED in that amazing sauce. Take the second cup of shredded cheese and sprinkle over the top of the casserole. 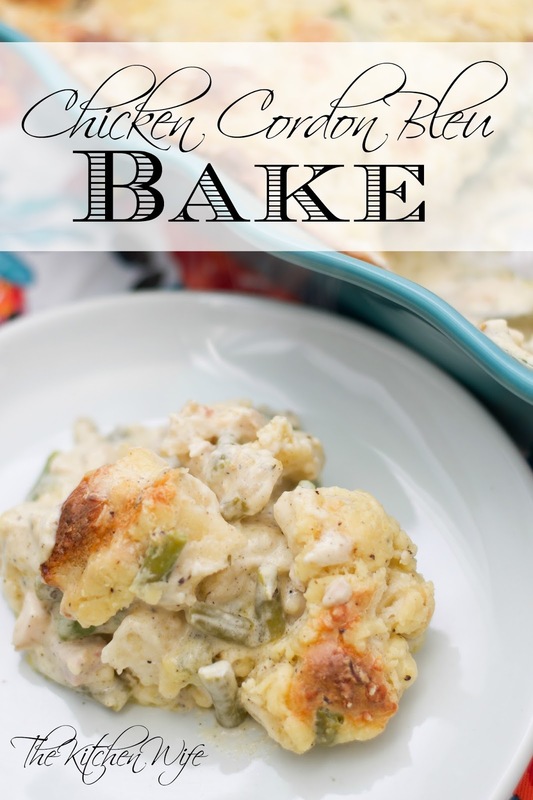 Place the Chicken Cordon Bleu Bake into the preheated oven and bake 45 minutes to 1 hour. I baked mine for one hour, but every oven is different. After one hour you will have this golden, bubbly brown, cheesy masterpiece. I love that this is an entire meal in one dish. Packed full of outstanding flavor, this Chicken Cordon Bleu Bake is guaranteed to be a family favorite! Juicy chunks of chicken, savory bits of ham, tender green beans, and the sauce..OH THE SAUCE! Yes, I know you are going to love this so get in the kitchen and make it TONIGHT! In a microwave safe bowl, combine the cream cheese and 1 cup of the cheese. Place the bowl into the microwave and cook for 1 minute, stirring halfway through. Once the cheese mixture in the microwave finishes cooking stir it together until smooth. To the cheese sauce pour in the milk and add the salt, pepper, and thyme. Whisk until smooth. Cut each biscuit into 8 parts and add to the casserole dish. Pour the cheese sauce over everything and stir until all the ingredients are coated in the cheese sauce. 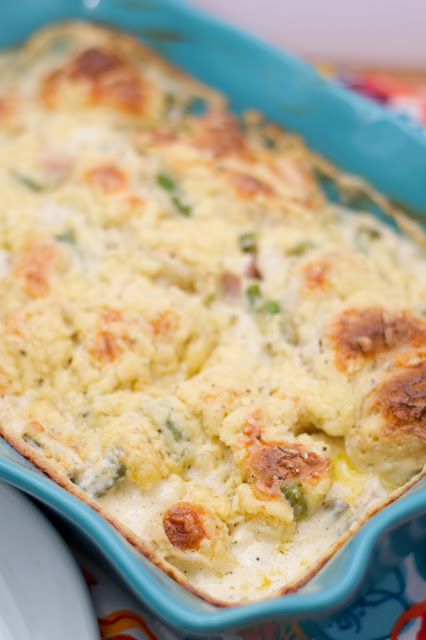 Sprinkle the second cup of cheese over the top of everything in the casserole. Place in the oven and bake, uncovered, for 45 minutes to 1 hour until golden brown on top. * You can use any kind of chicken or ham you desire. Leftover, rotisserie, deli sliced, whatever is easiest for you. In this recipe I used leftover grilled chicken and cubed ham steak. However, I have used many variations and it worked.